Hey everybody, this is Tezzeret. I haven’t been making cards much because my life is annoying right now, but my friend and I are making (or trying to make) a custom set called La'akea. The mechanics are doing well, but I'm trying to develop the creative design... and that is where YOU come in! I want you guys to come up with some fan-planeswalker RPG characters. You don't have to make cards, just type their names, a short bio, and their reason for coming to La'akea. Here's the backstory of La'akea. - In my corner of the lore, there was an event called the Great Aether Storm. Shortly after the (as yet unconcluded) battle on Ravnica, a nameless plane ruptured. The plane, and all the life on it, was destroyed. It created a disturbance in the Aether that rippled through the multiverse. Beings were scattered from plane to plane. It was hell as you could never imagine - Elesh Norn's Phyrexians fighting Kessig trackers from Innistrad and Theros soldiers. A planeswalker named Hal Greensmith sacrifices his spark, and all of the beings are returned to their normal planes - except on one. - La'akea still has beings from other planes. A samurai that once served under General Konda becomes a merchant captain. Elves from the Llanowar forest make a living selling all manner of things. Skirsdag cultists fit right in with the cultists on Hawalo Island. - La'akea has three main islands and underwater towns. Kalepa Island - the main island, which has a (supposedly) dormant volcano, a port, and a small forest. The island port, Kalepa City, is a thriving hub for commerce. Hawalo Island - chiefly covered in murky swamps to the east, with scattered villages on top of plains to the west. The swamps are frequented by cultists who terrorize the villagers. Nahelehele Island - an enormous island covered in forests with rocky plains. Mainly unexplored. Merfolk towns - The merfolk live underwater, harvesting underwater plants and pearls, going ashore on Kalepa, and selling them. The merfolk are peaceful, and they can grant people the ability to breathe underwater. So if you want to participate, just send a message below! This is mainly free-roaming. EDIT: The best planeswalker idea will get a follow and 4 favorites. The second-best will get a follow and 2 favorites. So, you are making a video game? @Ranshi922 More like D&D, more of a storytelling RPG. Talarian, origannally from the plane off Qwrnaj, an almost alien realm, filled with unexplainable horror. When the Aether Storm came, he was bounced to Zendikar, where he made a faithful decision to give up his soul in exchange for great power. When the vampires on endikar sent him off the plane, he was sent to La'akea. There he is seeking the great good of this land in which he has heard rumors about. And when he finds this mysterious being, he will slat him, gaining even more power for himself. Bump... why do I even do this anymore? He's known as Manyskins. He's a planeswalking shapeshifter of great ability. After a bad fight with a telepath Manyskins had his name wiped and even spent a few years as a planeswalking bird that thought it was just a bird. Now Manyskins has finally learned of his true ability and has returned to taking on different shapes. His problem though is not only does he not know his real name, he doesn't even know his real face, his original form. Manyskins has settled on La'akea because it's a place of people without a home, and that's who he is. He is also searching for a telepath powerful enough to restore his mind. Because he doesn't know his true form he changes shape/size/species often, out of boredom or necessitiy. @TezzeretofCarmot21 Also this is just a suggestion but if you want more people to post you could make this into a contest. "Post a Planeswalker card with an interesting backstory and flavour that comes to my plane. My five favourites get a favourite" or something like that... This site is about card creation and I'm sure you would get more responses this way. Just a thought. @Jadeor Probably it was a bad fight with the great god-pharaoh Nicky B. @Jaedor Very interesting planeswalker! I like the concept of a shapeshifting planeswalker, and the card is really flavorful! You arrive on La'akea in the middle of the night. You are atop a cliff overlooking Kalepa Island. You can see for miles around, including Kalepa City, the crude coral structures that indicate a merfolk settlement, and in the distance, across the ocean, Hawalo Island. You glance at the sky, lit up by flashing multicolored lights. The gods are having a quarrel. There are several bushes around, as well as a small dirt path down from the cliff. @TezzeretofCarmot21 thank you very much! Manyskins arrives on La'akea in the form of a dog. He eyes the sky gingerly. He observes the far off settlement and sniffs carefully, he knows the scent of merfolk. Almost instantaneously he changes form to become a scaly blue merfolk with tentacle hair and green eyes. He walks down the path hoping it will lead him to the town. You walk down the path. Eventually, you come to a fork. You smell the sea along the left path. There is likely a merfolk settlement there. The sound of a bustling marketplace - Kalepa City -drifts up from the right path. Which path do you take? I pause to ponder my options. Then I take the right path. I maintain the form of merfolk hoping that it will be accepted in the city. I head for the sounds of the city, knowing that if I have more hope of finding a telepath in a highly populated area. I make my nails grow longer and sharper until they are more claws than nails. I am ready to fight if needs be. The path slowly turns to stone as you walk into the city. Merchants line the streets, calling out to passersby. You see another merfolk, who nods a respectful greeting. You nod back. My first instinct is to run but I swallow my fear. I do not like being recognized or known, it usually ends badly. I try to appear relaxed. "Yes I am, my name is..." I pause, Manyskins I was about to say, but it is a little too descriptive and I want to be cautious. I look around for inspiration and look down at the road, "... Rad, my name is Rad. Who are you? How do you know who I am?" The man momentarily turns, contemplative, towards the sea. He turns back to you. You know what? Why TF not. I'll join. The thread seems a little lonely with only you two. 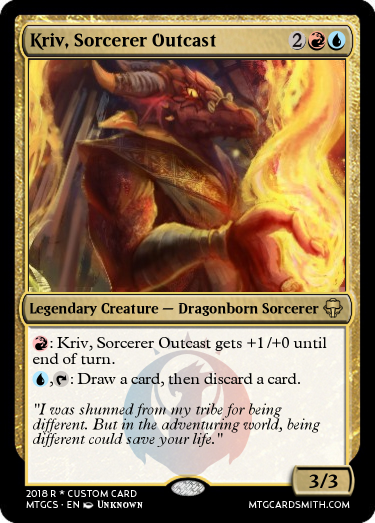 Kriv is a dragonborn sorcerer from a tribe that shunned magic. He discovered his powers at a young age, but kept them secret until one day when he was in the library and his power suddenly burst from him in a blazing aura, destroying the entire building and exposing his abilities. He was exiled from the tribe, and hopes to gain their trust back someday. Kriv is a kind of nerdy guy who loves books and stuff, but he is also a powerful sorcerer specializing in fire magic. He is extremely intelligent and quick-witted. Kriv was brought to La'akea a few years after being exiled. He was wandering through the woods, and came across a strange portal. Intrigued, he stepped forward to inspect it more thoroughly. Suddenly, someone pushed him from behind into the portal, and he ended up here. I relax a little. "That's a powerful ability you have, Vic-tor, dangerous may-be... I'm here on, Lakea did you call it? I'm here to ex-plore. I'm looking for a tel-e-path, do you know telepath?" I wince slightly hearing myself talk. I rarely take on human form and I know my speech sounds terrible. Most other animals have simpler, easier ways of communication, language is complicated, it has too many rules and weird sounds. @Aggroman15 welcome to the thread! @Aggroman15 Welcome! I'll start you off. As you fall through the portal, all you can see are blurry colors. You lose all sense of time and space, and almost do not notice when you fall out of the portal. You do notice, however, when you hit sand. You spring up almost immediately, before taking a look around. You are on a deserted beach on the western edge of Hawalo Island. A town's wall is visible on top of a distant hill to the east, and the chants of cultists can be faintly heard. At sea, several fishermen can be seen. There are several paths - one that leads to the distant town, one marked with arcane symbols that seems to lead to the cultists, and one that leads north and is marked by a sign that simply reads "Port." @Jadeor The old man grips the staff and inhales. Your question seems to have made him uncomfortable. He speaks slowly. "I know a telepath. His name is Mana'o. He resides in this city, ands he's extremely good. But you must be careful with him. Mana'o is one of the Ten Demigods, lesser gods that walk among the mortals and have incredible power. If you decide to see him, whatever you do, do not mention me. I owe him a... favor." He speaks this last word as if it were a vile epithet. "I can tell you his location. But be careful. He's devious and untrustworthy." "Where am I..." Kriv mutters to himself. He sees the signs, and recognizes Abyssal script on the middle sign. "Well, I'm definitely not going that way. That would almost certainly lead to trouble." He looked at the remaining signs for a bit, and eventually decided to go to the port, as that seemed like a good place to get some information about where exactly he was, and figured that it was closer to him than the distant city. I follow the Port path. The path leads to a small town with several hundred boats, big and small, lining its docks. Most of them belong to the town boat sellers, whose buildings are clearly marked. You contemplate taking a boat - you carry enough gold for almost anything in the town. There are blacksmiths, boat sellers, a bookstore, and a grocery. You wonder what, if anything, you should buy. "Mana'o... Demigod..." I chew the words carefully. "Yes, I will see him. Where can I find him? How can I be careful around a telepath?" "All right. First, go to the city's main square. There is a large building there - the Kalepa Bazaar. It's plated in porcelain, so it's pretty easy to see." He points at a large white silhouette rising over the rooftops. "West of the building, there is a street. Go down the street, and turn down the second alley. There's a door with a golden M written on it. Knock on the door three times, then open it right after. Mana'o will be waiting. "As for how to be careful around him, it's mainly luck. Just don't threaten him. He's nice for a demigod, just very powerful and mysterious. Don't worry, I think you've got this." Suddenly, he looks up towards the sea. "That's the fourth one this week," he mutters. "Sorry - there are a lot of planeswalkers coming here. Good luck with Mana'o!" And he disappears, having planeswalked away. You turn back towards the porcelain building and start walking. I make my way to the square, then west of the large porcelain building and down the street I take the second alley. I find a door with a golden M. I stare at it for a moment and allow my shape to change. I take on the shape of human man, fit and dark skinned with a simple tunic. I knock three times on the door. I see the bookstore and immediately head for there. I have learned throughout my travels in my world that books are almost always the best choice for learning about anything. I walk in and search for books about geography. I find a book called "Geography of Hawolo Island" and open it. You are surprised by what you see - the demigod Mana'o is a vedalken from the Esper shard of Alara, with a glowing etherium arm sitting in a chair that is staring at you with a bored but curious expression. He sits up in his chair and stares at you in an unsettling fashion. You open your mouth to speak, but he seems to know what you're going to say. "That's a powerful mental block you have on you, spark-carrier. Yes, I can fix it if you wish, and I have a low price. The price is this: You must describe to me a world other than this one. You must have seen some worlds in your time, correct?" The book has detailed maps of Hawalo Island. The page you opened to has an image of the central part of the island. A town marked "Hawalo City" is located directly in the center, and a river labeled "Kahawai Waterway" leads from the city eastward. South of the river is a large, blacked-out portion marked "Cult Claim." You flip through the pages until you find an illustration of the northwest portion. There's a long stretch of beach. The town that you saw in the distance is named "Heona Settlement," and the port you're in is marked "Grayport." The vedalken was definitely not what I expected, and his request surprises me but I nod my head. "Of course, Mana'o. I can describe the great plane of Zendikar, the first plane I can remember. It is exteremely mana rich and the scenery is constantly shifting and changing. The locals call this change The Roil. Settlements are scarce and only few outposts of civilization are present. But the most interesting feature are the large, floating polyhedron-shaped stones called hedrons that litter the landscape. These ancient, rune-carved monoliths are strewn across Zendikar. Up to ten miles long, some of these stones drift in the sky; others are buried in the ground, some whole, some broken. Trap-riddled ruins can be found everywhere. Mysterious glyphs hint at truths long forgotten. Unspeakable monsters lurk in the quiet of these hidden monuments of a forgotten past. The ruins still emanate power. This is the zendikar I discovered a few years ago. It is a plane of danger and long forgotten secrets. Does this satisfy you?" Mana’o has closed his eyes. He seems to enjoy listening to it. Finally, he opens them and stares downward. “Thank you. I have always wondered what it would be like to walk among the stars, to see other worlds.” He looks lost for a moment before clearing his throat and staring at you.